You are here: Home / Instagram / 5 Ways Monthly Meal Planning Saves You Money! You have about 30 minutes before the kids start flooding the kitchen with the unavoidable conversation of what’s for dinner. The problem is, you don’t have anything planned and now you know you are seconds away from your family transforming into small hungry monsters. Next thought, what is something fast you can buy for dinner? Now you are about to spend FOUR TIMES the money it would have cost you to make a meal at home. Let’s talk about how to fix this problem, save you money, and lower the stress of dinnertime. The solution is meal planning! I have a new love. I am completely infatuated with MONTHLY meal planning! I have been a huge advocate for weekly meal planning for some time now. But monthly meal planning takes my stress levels down to an all time low! Don’t you want that for yourself? Don’t let this topic overwhelm you! All you are going to need is a couple hours, one day a month, to plan for the next month. Get out your planner, favorite recipes, and of course Pinterest, and start making your menu and grocery list. I saved a good amount of money with my weekly meal planning. Once I gave monthly meal planning a try I was shocked that I was able to lower my already frugal grocery budget even more, by over 50%! 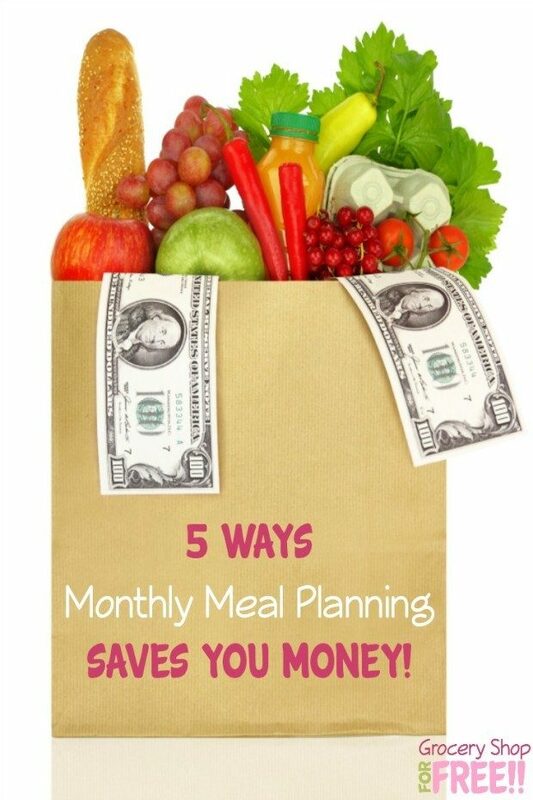 Here are 5 ways monthly meal planning will save you even more money! The very first thing that monthly meal planning is going to eliminate is the urge to hit the drive thru. Since you already know what you will be making for dinner tonight, you already have the ingredients ready to go, it really is a no brainer! Every time you buy takeout you are probably spending around four times the cost of making your meal at home! That is a lot of money people! By planning your meals the urge to hit up the drive thru will start to wander away. How many times have you been half way through prepping dinner and realized that you are missing a key ingredient? Quickly you try to scramble up the kids (who are already hungry remember?) and make a stop at the grocery store. Not only is this super stressful, chances are you are not going to strictly buy that one ingredient you needed in the first place. It’s a little scary how the costs of a few extra items each time you are at the store add up. Monthly meal planning is going to drastically reduce the number of times you go to the store each month and as a result minimize this extra spending. It’s simple. The less you have to drive your car the less gas you will use and the less money you will need to spend on gas. Once I switched from weekly meal planning to monthly meal planning we saved over $100 each month on gas! Moldy old produce and breads have made an appearance in our kitchen more times than I want to admit. It makes me sick (for more than one reason) to throw away food. It’s pretty much like throwing dollar bills in the trash. When you do monthly meal planning there isn’t going to be any moldy veggies hiding in the crisper since you will only be buying exactly what you need. No more impulse buying because you think that you need an extra head of lettuce because maybe you will use it for a meal this week. No more throwing your money away! Are you a stressful spender? You might not even realize it yet but you probably are. I am SO guilty of this! When the last minute dinner stress sets in, you are bound to spend more money than necessary. You will be amazed at how getting an entire month of meal planning out of the way is going to lower your stress levels and in more categories than just dinner! You will be freeing up more time in your week, and as a result you will have more time to think about all the other items that need your attention. Monthly meal planning equals less stress! Have I convinced you to try out monthly meal planning yet? I could literally chat all day about how much money it saves our family and how we make monthly meal planning work into our super tight budget. Hopefully after reading this article you are feeling motivated to start meal planning and save even more money! Brittany blogs at PenniesIntoPearls.com and shares about saving money while still living a pretty life. She discusses personal budget and fun ways to live within your means all while living fabulous! She loves to share gourmet recipes you can make at home for pennies, everything DIY and repurposed, and money management tips!